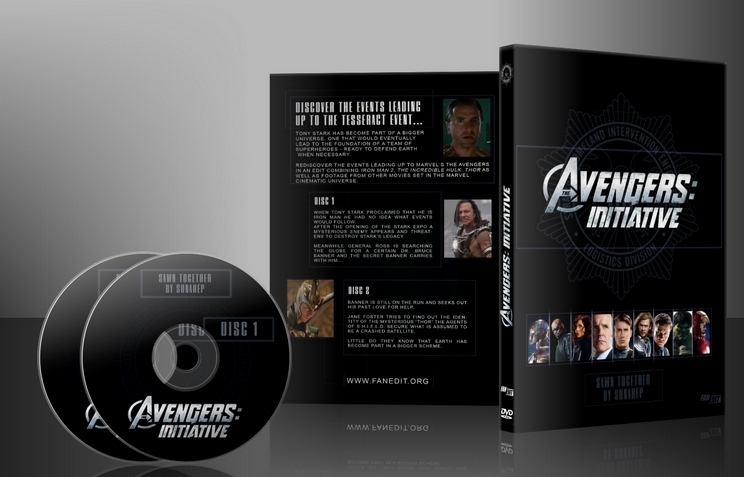 When Avengers was about to come out I scoured the Internet for an edit that would combine all the MCU movies into one chronological experience. Sadly what I found was an overly bloated edit that just threw in every single scene without proper musical transitions or anything. Because I couldn't find an edit like this I started to wonder - was that the only version around? It started out as a quick idea to put together an edit for me and my friends to watch before The Avengers. Due to the interest from the community I decided to revisit the rough edit. Smooth out things I did not quite enjoy that much, condense redundant things and try to give an entertaining ride one can take before watching the Avengers. 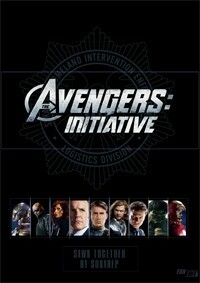 For a sort of "giant all night dvd session" with Avengers Initiative placed between Iron Man and The Avengers. The idea was to combine three movies (plus some scenes from other MCU movies) into one timeline. This is not an edit that sticks 100% to the official Marvel chronology. I tried to follow the Timelines as much as possible but when the question is between accurate time and enjoyment enjoyment always wins - something I learned from Jigsaw Files. An example would be Coulson who departs from Iron Man 2 to Thor. In the canon this happens before Thor gets banished because there are already strange storms happening. but movie wise I felt it was way cooler that Thor appeared and then Coulson got the call to go to New Mexico. Also The Incredible Hulk and Iron Man 2 have witnessed a lot of cuts and trims - Thor got away pretty unharmed. Those cuts were made because I was not content with those two movies and I want to improve them. I intend to cut the scene where Stark goes to Pepper in the office because it does not really move the story forward and because Pepper mentions "Tomorrow Hammer will have a presentation" which gives Tony one afternoon to drive back and an evening plus half a day to get a new element. Hulk has had a lot of scenes removed that show Banner doing stuff the audience can assume - like waiting for the guy who gives him the flower. In the next scene banner tells Blue that he has finally gotten the flower so the waiting scene is pretty pointless. Tony Stark does not talk to Ross as the scene - in the MCU - leads nowhere. He is a consultant but what he tells Ross is so contradictory they even made a one shot to explain the scene away. I did not include the Consultant One Shot because it felt more like comic book geeks talking instead of real characters. So without this scene the Tony Stark meets Ross scene serves no purpose but to advertise The Avengers without narrative consequences. Though superhero films have been around for a while it wasn't until the X-Men that it became a genre all of its own. While there's been more misses than hits Marvel studios has shown just what can be done in terms of building a superhero universe on the big screen. With Iron Man Marvel studios started what would become a cinematic universe combing all five films into one large story leading into one of the most enjoyable cinematic experiences I’ve had with the release of The Avengers. Sunarep edit split into two parts interweaving a complicated plot which results with the formation of The Avengers. These two edits are a good way of watching the films within a short space time, with all the characters and events happening the way they should. However it leads to certain characters being off screen for along time and when they reappear you have to pick up a story that was left off maybe 20min ago. This isn't a criticism towards the edit it's just how the story has to play out when viewing it as hole. Part 2 suffers from a lack of Tony Stark / Iron Man I felt the scene between him and General Ross could have been included along with Marvel One Shot the consultant if anything just to give him a little more screen time but also he is the biggest piece in the Marvel jigsaw puzzle it should have maybe ended with him. Part 2 also suffers from a lack of editing as it's basically the last 40mins of Thor and The Hulk with a little interweaving at the start. Again not a criticism against the edit it's just how the story pans out but maybe a few bolder editing decisions could have been made to bring the story down to around 3½ hour mark. Steve Rodgers / Captain America introduction is well done making good use of some deleted footage from The Avengers. I understand the longing for the scene with Tony Stark speaking to Ross from the End of Incredible Hulk and I knew that most people would not be happy with the scene gone, as this scene is pretty much the appetizer for the entire Avengers concept. But I chose to delete it for story-reasons. As I released the edit after Avengers i had the chance to go through all the cliffhangers again and see if there was an actual payoff in the Avengers movie (also a reason why I cut down Natalie Portman's part at the end of Thor where she is searching for him). With the Stark scene it was just a scene that was more there for the fans to get our anticipation up instead of driving the story. As established in Avengers SHIELD kept their distance from Hulk and even helped him from time to time to go unnoticed - so why did Stark approach Ross and offered him a deal to work with him? For that Marvel staged the entire Consultant one-shot clip which I would have had to include for the Stark scene to make sense, but that scene in my opinion was just a long scene of fanboys discussing things in the MCU mixed with as many bad wordplays as they could squeeze in. Basing this solely on part 1 because that's all i've seen. I watched this yesterday and I'm pumped for part 2, Primarily this focuses on Iron man 2, while dipping into Hulk 08 and Thor, I'd say about a fraction of thor is covered an half of Hulk, these will take center stage in part 2. How does it stand as a movie? it is completely watchable, I never found myself getting bored, because of the nature of the edit you zip between characters, there's always something happening to keep you interested. Given that Iron man 2 and Hulk weren't the best entries in the recent Marvel-verse, there;s just enough of the good stuff salvaged to tell a decent coherant story. Unlike neglify I perfer the back and forth nature of the films, though I wish a little less Iron man 2 had been included in part one, maybe saving the second encounter with Whiplash and his escape for part 2, but I'm nitpicking. I can't wait to conclude the outcome. This was pretty damn fantastic! I really enjoy watching Avengers edits now, thanks to Sunarep and Juice. I won't compare it to juice's edit (mainly because I've yet to see his Part 2) but compared to the theatrical versions, this is a worthy alternative to having a massive marathon before re-watching The Avengers. The only thing that bugged me was the overall structure. I liked that the films were intercut with each other instead of just playing out 1-2-3, but the flows felt off to a degree. I didn't have a huge problem with it but after having the finale of each movie I felt done for the night and put the edit on hold. I enjoyed the deleted scenes at the very end, but it felt a little dragged out in my opinion. Once the finale of Hulk happened, I was all set to rewatch Avengers. Video quality was great, but since these are 2 hour (plus) movies I personally would have preferred a more standard DL DVD. Not a huge thing, but quality loss is noticeable in Part 1. Overall, I loved this edit. It does pretty much exactly what it wants to do, give viewers a shorter, better companion piece to Captain America: Steve Rogers Cut, Iron Man 1 and The Avengers.